Dundee United tried and ultimately failed with three deadline-day bids for Hibs’ prized midfielder as they searched for a replacement for Stuart Armstrong. The highest offer was £250,000 and Hibs had no intention of selling the 23-year-old. Allan has been Hibs’ most creative force this season and his form has attracted suitors. To have any chance of promotion, head coach Alan Stubbs needs to keep his best players and going into February with Allan still in their ranks enhances their credentials. Fyvie’s career may have gone off the radar since his move to Wigan, but it’s worth noting that the 21-year-old has an FA Cup-winners’ medal on his mantelpiece from his time in Lancashire and that he returns to Scotland a much more rounded player than the once that left Aberdeen when he was a teenager. He is strong, dynamic and passes the ball well and is sure to offer Hibs another dimension in midfield. Signing the ex-Hamilton and Czech Republic international is a smart move, as before his arrival only Mark Oxley had any serious claim to the No.1 spot. Cerny has experience of Scottish football and is an athletic, reliable keeper. 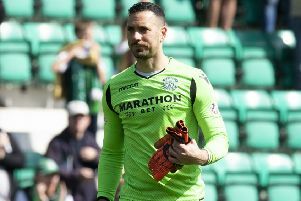 Oxley has had no serious challenge for the gloves at Hibs and some recent shoddy decision-making when dealing with crosses won’t have gone unnoticed by the Easter Road coaching team. Cerny could well turn out to be the answer for Hibs between the sticks. The Bairns beat off a couple of late bids from Hamilton Accies to land top-scorer Loy. This will have an impact on Hibs. The ex-Rangers striker could well be up against the Hibees in the play-offs and he’s already scored against Stubbs’ men this season, netting the winner in a 1-0 victory back in August. Falkirk look the best bet to be in the play-offs alongside Hibs and Rangers and they are a much stronger team with him in their XI. Mike Ashley’s links with the Gers and Newcastle could not have been more apparent as Shane Ferguson, Haris Vuckic, Kevin Mbabu, Remie Streete and Gael Bigirimana arrived in Govan on loan from Tyneside. Little is known about the five players, but they give Rangers a little more impetuous going forward and that could help them fend off Hibs for second spot. Certainly, they are unlikely to weaken an already morale-sapped and ageing squad.